YGC – shortlisted in the Impact in Climate Resilience category for the New Civil Engineer Companies of the Year 2019 Awards. 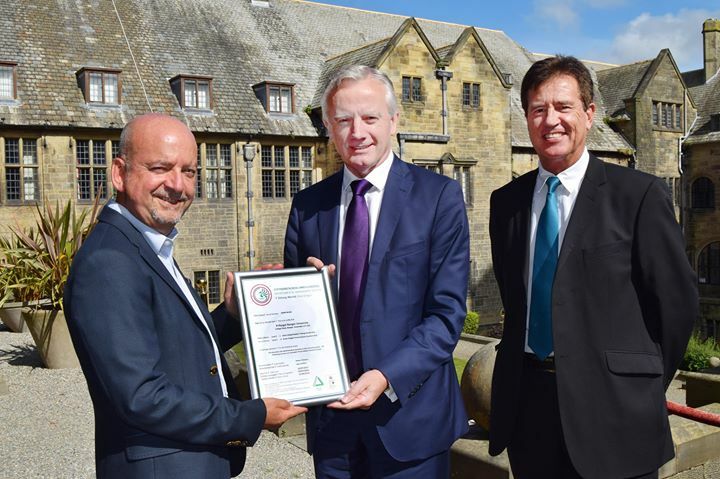 Robert Williams of YGC presenting Professor John G Hughes, Vice Chancellor of Bangor University, and Ricky Carter, the Environmental Manager, with their Green Dragon Certificate (Environmental Management Standard). Following an intensive external audit carried out by YGC, on behalf of Groundwork Wales, Bangor University successfully achieved ISO 14001:2004 certification for its commitment to continual environmental improvement. ISO 14001 is the internationally recognised standard for organisations that proactively control their environmental impacts through a formal Environmental Management System (EMS). This award builds upon our Green Dragon certification which the University has held since 2009. “Both the Green Dragon and ISO14001 standards require systematic control of those activities that can have an adverse impact on the environment. In our case these include our energy consumption, use of natural resources, handling and disposal of waste, and business travel. Green Dragon is a highly credible management standard within Wales and to build on this by achieving ISO 14001 certification clearly demonstrates to our stakeholders at a global level, that our University is committed to protecting and enhancing our natural environment”.